Once again, Tehran was shut down today as air pollution reached dangerous levels. The shutdown today, included all schools, educational places, government offices, banks, factories and production units that burn oil to operate with. All sporting events and exercises in open air were cancelled. Only one university, Payam Nour, was allowed to hold its exams but the rest of universities postponed their exams. Only staff at medical emergency places were required to go to work. Earlier this week, the authorities had once again introduced the "odd/even number plate" plan. This plan requires vehicles with the licence number plates that end in odd or even numbers to be driven only on alternate odd/even days. It was hoped that the reduction in the traffic would reduce the air pollution, but it was not enough. Ambulances were stationed in 5 main squares throughout Tehran to cater for people with heart or respiratory problems who were affected by the pollution. The casualty figures as a result of the air pollution are horrendous. Hasan Aghajani, an advisor to the Health Ministry, in an interview on state TV said, "in the last few days, 30% more patients were admitted into hospitals as a result of pollution related problems in Tehran" Aghajani also stated 4460 deaths were related to the air pollution in Tehran. Massoumeh Ebtekar, known as Mary to the rest of the world, as the spokesperson for the US embassy hostage takers in the eighties and now head of Tehran Municipality Environmental Committee, said most of Iran's major cities are suffering from dangerous levels of pollution. She also said there are solutions available to combat the pollution but the will is not there. Ahmadinejad's first deputy, Mohamad Reza Rahimi, is not happy about the emergency steps to reduce traffic. "We can not stop people from earning a living by driving their cars just for the sake of reducing air pollution" he told reporters. This is a failed revolution on ALL levels. Iran's natural resources are being squandered, lakes are drying up, economy is in a downward spiral, historic heritage and landmarks of Iran are being destroyed and the country is facing an environmental catastrophe. In the old days, it was a pleasure looking north and seeing the magnificent Alborz mountains, I was told today by a friend in Tehran, that he couldn't even see the end of his street, let alone the mountains to the north. 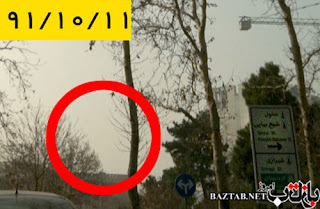 The two pictures above show how the Milad Tower, built after the revolution as a landmark to signify the greatness of the 1979 revolution, has disappeared from the view as a result of the pollution and the video below shows the cracks and the dilapidation of another iconic landmark in Tehran, the Shahyad or as they renamed it after the revolution, the Freedom Tower. The engineer who managed the original project, pines with bitterness at how the iconic landmark is facing ruin as a result of neglect and mismanagement. Even the thick waterproof slabs around the tower were taken out and replaced with porous thinner slabs which are now allowing water to leak and flood the foundations of the tower. The longer this regime remains, the more likelihood that there will be no Iran left to rebuild. Maybe this is why Iran wants nuclear power plants? So it can stop burning fossil fuels leading to all this. Again it's the West playing a double game. Sanctions on one side forcing Iran to produce her own petrol (of a crappy standard) and not allowing Iran to go nuclear.